Many money matters change on or around your 70th birthday. Some things stop, some things start, and some options become more attractive as you age. As we're living longer, it may make sense to consider waiting until the age of 70 to retire, but even if you're retiring earlier, you'll want to know about the seven things below that change about the time you turn 70. Up until age 70, your Social Security benefits accumulate delayed retirement credits. As a result, there is a significant benefit to deferring Social Security. If you defer your Social Security benefits until the age of 70, you'll get 132 percent of the monthly benefit because you delayed getting benefits for 48 months according to the Social Security Administration. However, there is no benefit for waiting past age 70 to start collecting your benefits, but for many people, married couples, in particular, there can be a great benefit to having the highest earning spouse delay the start of their Social Security benefits until age 70. The higher benefit amount will then continue in the form of a survivor benefit for the longest spouse to live and can provide a powerful type of life insurance in the form of inflation-adjusted life-long income. By April 1st of the year, after you reach age 70 ½, the IRS requires that you start taking withdrawals from your qualified retirement accounts like IRAs or 401(k) plans. Although many people wait until they are required to take these distributions, this does not always make sense. If you had lower income years before reaching age 70, it could make sense to withdraw money from retirement accounts and pay little to no tax. You have to run a tax projection each year to determine what might be best. Regardless, at 70, you will have to start taking withdrawals or required minimum distributions (RMDs) from your IRA, SEP IRA, Simple IRA, and 401(k). It's important to note that if you don't take your RMD at 701/2, the IRS will levy a tax on the portion that you don't withdraw. According to the IRS, "you may have to pay a 50% excise tax on the amount not distributed as required." However, Roth IRAs do not have to take an RMD. The longer you live, the longer you are expected to live. If you have good genes and a healthy lifestyle, then you may want to consider guaranteed income choices that provide income for life. Some of these choices, such as immediate annuities, become attractive at age 70, but you must do your research and contact a financial planner because there are pros and cons to all annuities. Retirement income sources like immediate annuities enable you to take advantage of something called a mortality credit. If you may be long-lived, this type of product becomes a more attractive option around age 70 and can ensure that you will not outlive your income. Reverse mortgages become worthy of consideration at age 70 and beyond also. A reverse mortgage can allow you to use the equity in your home for income while remaining in your home for as long as you want. A reverse mortgage can be an option that provides you with guaranteed income and no risk. And, contrary to popular belief, the bank cannot take your house with a reverse mortgage. 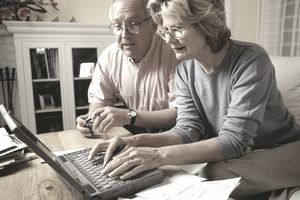 If you are going to retire at 70, and need retirement income from your savings and investments, you will need to learn what investments can generate the amount of income you need. It is not the time to take risks. You need this money to last the rest of your life. One option is to use safe investments, which may pay a low amount of income, but your principal will be guaranteed. For example, a bond ladder is a popular income generating strategy whereby you purchase bonds (individual bonds, not bond funds) in your account so that the maturity dates of the bonds are staggered, or laddered, across a specified period. You would withdraw the funds when the bond matures providing you with income. Another option is to build a portfolio of investments following a prescribed set of withdrawal rate rules. One popular strategy is the 4% Rule, which allows you to withdraw 4% of your beginning retirement balance each year for income. The idea behind the rule is that by taking out only 4% each year and investing the rest of your savings, you're unlikely to run out of money in retirement. You may want to seek out the services of a qualified retirement planner to help you figure out what is best for you. Age 70 is also an excellent time to make sure you have a medical emergency plan in place. It can be as simple as having a set of written instructions for a trusted family member or friend. You'll want to make sure you have named someone to manage your affairs should you become ill or incapacitated. It is accomplished through a trust, or with a durable power of attorney and a health care power of attorney. Also, be sure to review your beneficiary designations and other important estate planning documents like a will or trust.